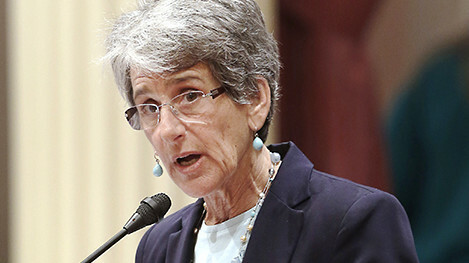 California Sen. Hannah-Beth Jackson, D-Santa Barbara, has introduced a bill that will limit sterilization surgeries in state prisons, county jails and other detention centers. The proposal would close several loopholes on inmate sterilizations and for the first time bring California law up to federal standards. The vice chairwoman of the California Legislative Women’s Caucus introduced legislation this morning that will limit sterilization surgeries in all state prisons, county jails and other detention centers to prevent possible abuses in the future. Spearheaded by state Sen. Hannah-Beth Jackson, D-Santa Barbara, SB 1135 would ban sterilizations for birth control purposes in correctional institutions. Surgeries would be restricted to life-threatening medical emergencies and the curing of physical ailments, according to documents obtained by The Center for Investigative Reporting. The bill is the culmination of talks among lawmakers, prison rights advocates and correctional officials that occurred in the wake of a CIR investigation that found that 132 women received tubal ligations in violation of prison rules from 2006 to 2010 – and perhaps 100 more dating back to the late 1990s. Former inmates and prisoner advocates told CIR that prison medical staff coerced the women, targeting those deemed likely to return to prison in the future. The bill requires that in cases of not life-threatening sterilizations, prison officials attempt less drastic measures first, seek independent physician approval and provide for extensive inmate counseling. Prisons performing sterilizations must report annually the number of surgeries by race, age, reason and surgical method. If passed, the proposal would close several loopholes on inmate sterilizations and for the first time bring California law up to federal standards. Federal and state laws ban sterilizations if federal funds are used but allow for the use of state money to pay for the procedures. Prison rules have restricted tubal ligations since 1994, but no such limits were placed on surgeries that removed women’s uteruses and ovaries. Joining Jackson in support of the bill are co-sponsors state Sen. Loni Hancock, D-Oakland; state Sen. Joel Anderson, R-El Cajon; and Assemblywoman Bonnie Lowenthal, D-Long Beach. Jackson said she expects a policy committee to hold a hearing for the sterilization legislation by spring. California has an ugly past of sterilization abuse, with an estimated 20,000 women and men stripped of the ability to reproduce between 1909 and 1964. Minority groups, the poor, the disabled, the mentally ill and criminals were singled out. A spokeswoman for the California Department of Corrections and Rehabilitation declined to comment on legislation. Joyce Hayhoe, spokeswoman for the federal receivership that oversees the state’s prison medical care, praised the announcement. “The receiver’s office is supportive of the bill being introduced by Sen. Jackson,” Hayhoe said. Cynthia Chandler, an adjunct professor at Golden Gate University School of Law and co-founder of the Oakland-based prisoner rights group Justice Now, called the bill affirming and said the group was proud. Since the mid-2000s, Chandler’s group has pushed actively for an end to prison sterilizations, gathering data and firsthand accounts from female prisoners about questionable and damaging surgeries. Since last summer, the group has worked closely with Jackson’s office to craft the language for her proposal. “Justice Now hopes that this bill moves attention toward ensuring all California families have a future by sending a clear message that coercive sterilizations targeting imprisoned people are not tolerated,” Chandler said. This story was edited by Amy Pyle and copy edited by Nikki Frick and Christine Lee.